Anthony Burns was an escaped slave. He was captured in Boston in 1854 and, per the Fugitive Slave Act of 1850, shackled and marched through town to the bay, accompanied by 2,000 federal soldiers. President Franklin Pierce, eager to prove he could make nice with the pro-slave South, defied the popular will of the radical abolitionists of Boston, and forced Burns’s return to slavery. Abolitionists were understandably incensed at an act they saw as inhumane, vile, and villainous. 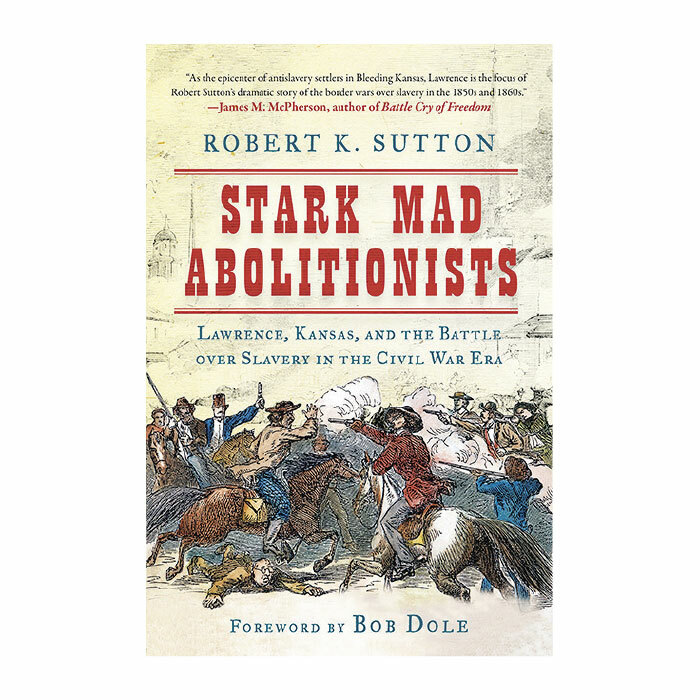 Lawrence put his newfound passion to work, and “combined his fortune and his energy with others in the New England Emigrant Aid Company to encourage abolitionists to emigrate to Kansas.” Newly a territory in 1854, Kansas was hotly contested by abolitionists and pro-slavers. During the Civil War, there were guerrillas everywhere on the Kansas-Missouri border. The fighting was bloody, with Confederate sympathizers murdering men in front of their wives and children—and worse. Of course, from the pro-slavers’ perspective, the abolitionists were villainous, inasmuch as they didn’t respect the slave-owners’ property. The abolitionists would sneak onto slave-owners’ land, free the slaves, and then “conduct” them north to Canada. Lawrence finally visited Kansas, and the town named after him, in 1884. Stark Mad Abolitionists is a highly readable account of a bloody period of U.S. history, and one that bears reflecting on in view of our current struggle over race, immigration, and states’ rights.